Description: Pied wagtails are small black and white birds with a long, wagging tail. In the summer male pied wagtails have a white forehead, cheeks and belly with a black mantle, head, throat and breast. The back is grey. During winter the back is darker grey and the throat is white. Females are darker grey with a black crown, throat, breast, rump and tail. Juveniles are brownish grey with yellowish-white parts. Nesting: Pied wagtails build their nests under roof tiles, in walls and buildings or beneath stones. The nest is cup-shaped and made from grass and moss. They lay 3-7 pale grey eggs with darker spots. Both male and female pied wagtails incubate the eggs for 12-14 days and the chicks fledge at 13-16 days. 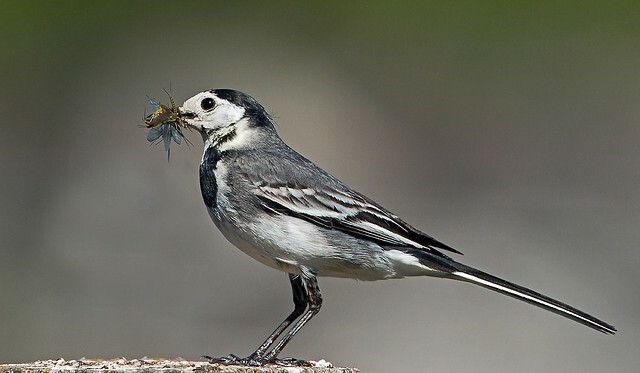 Feeding: Pied wagtails will forage in the ground for insects usually in open areas. Where to see them: Pied wagtails can be seen all year round across the UK except some of northern Scotland during the winter. They are often found near water but can also be found in town centres. Did you know? Polly dish-washer, Peggy dish-washer, Moll-washer, Molly wash dish, Polly wash dish, Washtail. Willy wagtail and Nanny wash tail are just some of the nicknames given to the pied wagtail.